The post is brought to you by Janalyn Voigt, a novelist who helps readers escape into worlds of beauty and danger. Be sure and read to the end to learn about the giveaway. Once upon a time and far away, in an era almost forgotten, knights protected honor to the death, sustained the weak, and favored women. Ah yes! The romantic age that gave us the legends of King Arthur's Camelot and the Knights of the Round Table. We still understand the concept of chivalry these days, but it's lost the grandeur of its origins, which lie in something larger than a man opening a car door for his wife. Chivalry evolved from the Old French chevalerie, which meant "noble knight" combined with the Medieval Latin caballarius, or "horseman." It originally applied only to knights. In the 11th-Century "The Song of Roland," also known as Charlemagne's Code of Chivalry, described 8th-Century battles and also a knight's duties. Each knight was to fear God and remain faithful to the church, serve his liege lord, protect the weak, succour widows and orphans, avoid offending others, live with honor and for glory, eschew monetary reward, fight for all, obey authority, guard the integrity of his fellow-knights, reject iniquity, remain high-minded and honest, keep to his faith, always speak truth, persevere in all things, uphold the honor of women, never shrink from the challenge of an equal, and valiantly engage foes. The ceremonial pledges taken by knights soon melded with this code of conduct, and medieval bards idealized the concept of chivalry with poems, ballads, and literature. Tweet This! There wasn't a single code of chivalry, but rather the sacred oaths varied by order of knighthood. Late in the 14th-Century the populous as a whole adopted the prevalent ideals in the chivalric codes as a moral system. In the 18th-Century, the Age of Chivalry took on the romanticized aspect familiar to us today. The knight would swear allegiance to his liege lord in an oath of fealty that often involved the bestowing of land rights. The lord promised to protect his knight, and the knight pledged to remain loyal to his lord. The knight expected to suffer divine consequences should he falter in his duty. 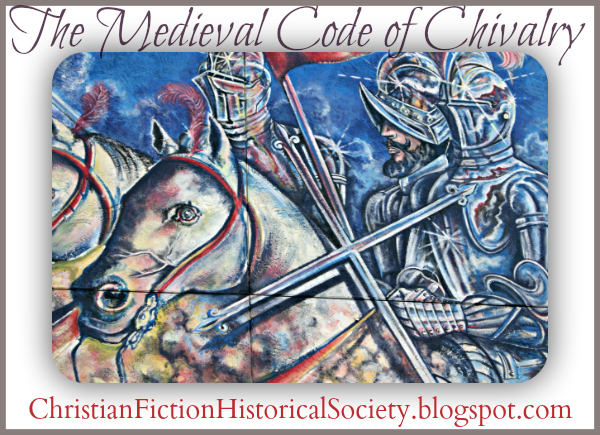 Although the chivalric codes adhered to by knights weren't identical, they did align duties to three entities. Tweet this! Countrymen could expect mercy, fairness, and service from knights of the realm. Knights protected the weak and poor, to the death if necessary. God could be served by providing protection to the innocent, faithfulness to the church, and generosity in all things. Knights were to champion good over evil and obey God. Women were to be treated with gentle graciousness, reverence, service, and courtly manners. A knight should never give evil counsel to a lady and must respectfully defend her. The focus of the particular order of knights would determine the emphasis. Gone are the days of knights and castles, but in a very real sense the chivalric code of honor, based as it was on Biblical concepts, remains alive today. As a writer of medieval epic fantasy novels that extol these virtues, I have noticed great interest from my readers in these concepts. I'm convinced that, despite the modern era in which we live, on a gut level people today still understand and crave chivalric virtues. Tweet This! At the royal summons, Shae mounts a wingabeast and soars through the air to the high hold of Faeraven, where all is not as it seems. Visions warn her of danger, and a dark soul touches hers in the night. When she encounters an attractive but disturbing musician, her wayward heart awakens. Sometimes victory comes only through surrender. 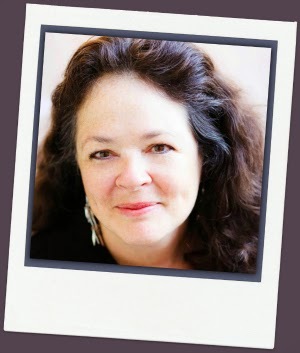 I'm Janalyn Voigt, an author and speaker. 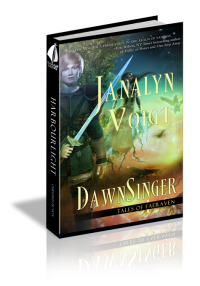 DawnSinger, my debut novel and the first installment in the Tales of Faeraven epic fantasy series, released with Harbourlight Books in 2012. Wayfarer, book two in the series will release in 2013. My other projects include DawnKing, book three in my medieval epic fantasy series and a romantic suspense novel set in a castle. My spare time activities include reading, gardening, and finding adventures with my family in the great outdoors. Great post! I love Medieval times. Your book sounds really good. Please enter me. God bless. Thanks for the compliments, Debbie. Best wishes. I have an exam on Chivalry today at University (where I have been studying the subject since January). It's certainly an interesting, rich and multi- faceted subject, but also rather complicated too, and not always as clear cut as it may appear to have been. For instance, it seems that the Code did not always apply to peasants and commoners, and there could be a vast between the laws of war, and the laws of Chivalry. As to oaths, Perjury (or breaking/ being false to the oath) as I think it was known was indeed a serious offense, I think it was actually considered to be a mortal sin and treason definitely was not taken lightly. Hi, Bookish. I love your insights. True, there was a difference between classes with regard to treatment of women, but knights also had to defend the poor. Chivalry did have its dark side. The Crusades arose out of the religious fervor that informed chivalry. Yes, oath-breaking might lead to death and worse: damnation of the knight's soul. Yes, the chivalric ideal could be rather different from the reality. As to the crusades, whilst I don't condone all the killing the crusaders did, or support the theology behind them, they were not entirely unprovoked. In fact, the Turks and others had been attacking the Byzantine (Greek speaking Eastern Roman) Empire and Europe for centuries, and had taken over a lot of territory. In fact not long before the 1st Crusade the Byzantine Emperor had appealed for help from the West, after there had been a huge battle in which they had suffered a terrible defeat. That's an interesting bit of history about the Turks, Bookish. I entered you in the contest. Thank you for this great post, Janalyn. Great giveaway, and a truly fascinating time in history. Hi, Kathy. You are quite an encourager. Thank you. Oh, how I'd love to see chivalry more today! But, as you pointed out in the knights' code, chivalry comes from a recognition of one's duty to God, and if that is not present, there is not likely to be much in the way of chivalry. Your post was a good reminder of what our world needs most today - allegiance to God through salvation in Jesus Christ, so that He can work the changes in each heart that are needed. Good point, Bethany. The best and most chivalric act ever recorded was Jesus Christ going to the cross in order to free mankind. Hi, Joy. If only we could step back into the day... I guess we'll have to rely upon books to take us there. Betty, your comment made my day! Thanks for appreciating my book. Isn't history fascinating? I never thought of the fact that chivalry has a history! I really do love the code of chivalry and wished it was still honored today. Can you imagine? Oh how I love history. Sounds like a wonderful book! Thanks for the fun info! History is so fascinating with all the different things we can find. This isn't my favorite genre, but that era was indeed one of chivalry and romance. Thanks for the enlightening post. Hi, Martha! Thanks for stopping by and commenting. I agree. I never get tired of discovering history. I agree, Eliza. It boggles the mind to think of such things. I enjoy reading history, but this was great. I honestly did not know all that was required of the knights. If we had the knights today maybe our world would be much better. Thank you for the chance to win in the giveaway. Barbara, now you have me daydreaming about knights...:o) You're welcome. Thanks for entering. Oh I LOVE books set in medieval history and so wish there was more available in christian fiction! This sounds wonderful - enter me, please! Hi, Becky. I agree with you. I'd love to see more Christian fiction titles set in medieval times. I entered you in the contest. It sure takes my breath away when a guy has these virtues. I guess the romantic in me has always been waiting for her prince charming. Maybe one day I'll find him. For now dreams and stories will have to do. I'm a total romantic, too, Kim. Here's hoping you meet your prince. Kim, you were one of the giveaway winners but the email I sent you bounced. Please contact me at janalynvoigt(at)gmail(dot)com to claim your prize. And now for the big announcement! The randomizer selected the following winners of my giveaway of a Kindle or Nook copy of DawnSinger: Eliza Elliott, Becky Doughty, and Kim LitlePokie! Wonderful post, Janalyn! Sorry to be so late catching up, but I loved this post about knights.